ELVEN was born in 2004 in Lombardy (Italy), near Milan, from an idea of guitarist / vocalist Andrea C. (Berg) and bassist Davide C. (Ilden). Few months later singer Iviana B. (Ivy) joins the band, giving particularity to a style considered generally "male" from a vocal point of view. The name of the band (from Norw. "the river") means to evoke the atmosphere of the natural landscape of the area where the band lives, and express its passion for Nordic culture. We've faced several line up changes since there, so we can say Berg, Ilden, Ivy & Hammer are the ELVEN now (from Feb. '05 to Nov. '07, the band has also a second guitar, unfortunately only for short periods). We were all coming from other bands, and today we work also on several other projects: Berg is the new lead guitarist of the Norwegian doom metal band Syrach and he's also a session guitarist for Italian death metal band Laeta Mors and others; he's also contributing to Ivy's main side project (Ivy Versus Poison Ivy), while she collaborates with Bulgarian In Thy Kingdom, and others. We have two official releases: the self-produced demo "DAMNED MARSH" (2005) - a concept album related to local history, chronicles, legends and natural atmosphere, - and the self-produced promo-EP "SOMETHING WICKED" (2008). ELVEN had to face long delays to solve problems, braking composing / studio / live activity too often because of the line up changes. That's way our first album had to wait so long its release (and also because half of the band moved to Bergen, Norway in 2009). ELVEN's live activity has been continuous between Nov. '05 and July '09: we love the stage and playing live - we met great supporters (we salute you and thank you all!!) - and our last shows were all previews of the forthcoming album, because we love to experience people's curiosity and to satisfy it. Right now, we are recording our first album, half in Italy half in Norway, and we are already writing the new songs for the second album. The programming of the band's live activity for 2011 goes on, too. We feel in excellent shape and we're full of ideas and expectations, never mind the distance! BERG: It's a melodic extreme metal, mostly influenced from black and death metal, but not only. My musical influences are Pantera, Emperor, Keep of Kalessin, Dissection, Opeth, Bloodbath, Morbid Angel, Nile, Zyklon, and all together with them the giants of music Pink Floyd, S. R. Vaughan, Van Halen, Black Sabbath. IVY: The listeners will define better our genre. We've got many different opinions and definitions about it. Probably, because we've changed from "Damned marsh" till now. I love lots of artists so different between them, some give me simply great energy (Hypocrisy, Emperor, Nevermore, Soilwork, Testament, Sentenced, Deep Purple, Borknagar, Enslaved…. ), some are talents I quietly and deeply admire (Opeth, Ulver, Ayreon), others are interesting to me because of the way they write and perform their songs (My dying bride, Arcturus, Katatonia, Faith no more, Moonspell, Alice in chains,). My main inspirations as a singer are the unique Bulgarian voices, Lisa Gerard (Dead Can Dance), Anneke (ex Gathering), A. Lennox, Anathema, Kr. Rygg (Ulver/ex Arcturus), Andrea Nebel (Hagalaz Runedance), Fiona Apple, Clannad, R. J. Dio (the one and only…R.I.P. ), The 3rd and the mortal, blues and soul female voices, too. HAMMER: Brutal legend black metal, ha-ha!!…. My influences? For me Nile and Behemoth are above all, Keep of Kalessin, Watain, Carpathian Forest and so on… "
ILDEN: I think extreme Scandinavian music is basic influence here. IVY: Considering that, besides being musicians, we're music fans and that we've loved one genre or another during the years, we now prefer ourselves listening to bands able to propose a variety of ideas, put and mixed together with personal style, even when extreme, without boring the listener. I think that, if this is what we pretend as fans, it's quite easy that we've been good in reflecting this taste into our music. There's another reason to buy our works. If the listener likes our music from what he's able to check and listen to on Internet or in any other way, why not buy an ELVEN cd: isn't that the smallest but most honest gesture to support not only a single band, but in our case the "underground" scene itself, which generally asks for less money but often offers more real passion for music and brilliant ideas and energy than the same known big names? Big names are not an automatic guarantee of excellent quality of ideas, not even of originality, but only of sound improvement and its impact, both on cd and live shows, may be. I think it's a good idea to stay always curious and think twice before spending our money for bands that are already simply copying their previous albums, lacking in freshness and originality. There are so many bands to discover and encourage, their cd s aren't in the big stores, but visit their pages, buy from them directly, go to their concerts, support them, they won't forget! If people continue to support most of all the obsolete old music, there will be no real improvement, no variety, and music won't have else to say but "the same old song and dance"! BERG: Because we play music not only for fans of the extreme genres or of more melodic ones. Our music is all those genres, together, any metalhead could find and enjoy something interesting in it: we are not interested in satisfying only particular niches of fans, we love to vary, not repeat ourselves if possible, to mix, to pass from taste for the modern through taste for the past music, from taste for extreme through taste for the absolutely classic. And this will be your experience with our first full length album. ILDEN: There's a good reason you can easily find in listening and comparing by yourselves our 3 different releases: you will notice a progressive evolution both in our composition and sound. ILDEN: We have two official releases: our demo "Damned marsh" contains 4 songs, and our ep "Something wicked" contains 2 long songs. Both releases were appreciated from the public and from the media, and we hope it could continue even better in the future. IVY: Since the beginning, we aimed at playing live a lot, being the best way to get known, and the public always replied with enthusiasm, at the point that I won't exaggerate if I say that it's thanks to our audience that the media are interested in our releases still today and seem more curious about ELVEN . 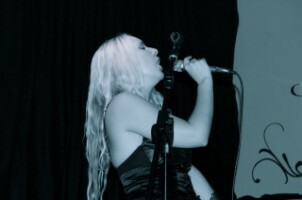 BERG: We interrupted the concerts in 2009 for two reasons: 1) we were concentrated on finishing the album writing and preproduction, and on starting as soon as possible the recordings, but all this was partially slowed down because me and Ivy had to move to Norway and the distance with Italy didn't simplify ELVEN's live activity; 2) I was personally very busy also with Syrach, my new band here in Bergen: we left for a double european tour in Sept. / Oct. 2009 and after that we started to work on the new Syrach album too. IVY: As I was telling you before, concerts are the most important, true and emotional part of what we do, that's why we've been searching for as much as possible occasions to play live in the last 5 years (ok, 4… we stopped in July 2009). Even if our works are released distant in time, simply delayed against our will and power, we always used our live shows to offer the audience previews of the song we were writing. We miss the stage, but when the new album is out, we will restart the programming of our live activity in 2011. IVY: The webzines (and not only) have the wonderful opportunity to check lots of bands and to discover those really worthy of encouragement, not only of compliments: I can say that zines' interest is somehow their job, right? And if a band is able to move zines' and audience's enthusiasm or big interest, the band's at a good advertisement level. And this is our case. So, if this is the first step to catch public attention and appreciation, then why shouldn't a label be the next one? :) Personally, I'm very sorry that the the figure of "talent scout" does not actually exist in Europe today, otherwise the good emerging bands gigs would be enough for the public and for the market, they would be enough for the joy of all. BERG: We're a band making right now its entrance in the bigger metal scene, with its forthcoming album. This only means that we still have so much to offer, ideas to develop and express in the future, we are always ready and love to play live, and I think that what we do and the way we do it, could bring great satisfactions both to us and to labels/promoters. ILDEN: For the same reasons a metalhead should buy an ELVEN cd. HAMMER: We believe in what we do and we intend to remain in circulation for a long time! HAMMER: We have to finish our debut album recordings. It will be very fast and powerful! BERG: Exactly, and it will be an evolution of our style compared to the ep from 2008: it will be an album of bigger impact, much more energetic, with more blast beats, and this doesn't mean that it will be more extreme but more powerful. There won't be missing our typical elements, the mix between styles and atmospheres, between black - death - thrash metal, also something that could delight the fans of gothic and the more modern doom metal, considering that we have a beautiful female voice. So… we'll spend the near future preparing for the album to be out to see what will bring to the public our passionate work. ILDEN: We will distribute the new album in the stores and digitally and work on finding the right occasion to promote it outside Italy. Or you can of course contact the band, if you're interested in buying any kind of merchandise, or if you have special requests of any kind.